Origin and Habitat: Acharagma aguirreanum occurs in the western edge of the Sierra de la Paila,Coahuila, Mexico (Extent of of occurrence less than1 km²). Altitude: It grows at an altitude of about 1400-1600 metres above sea level. Habitat and Ecology: It grows in semi-desert on low hills and washes in shady areas, such as along canyon walls or under bushes, but quite to the contrary, many of the plants grows wedged in the brunt of the full sun on limestone ridges. The species is critically endangered . The total population numbers is less than 1000 individuals in a continuing decline due to illegal collecting. The same area support endemic succulents and xerophyte plants such as Ariocarpus fissuratus, Astrophytum capricorne var. 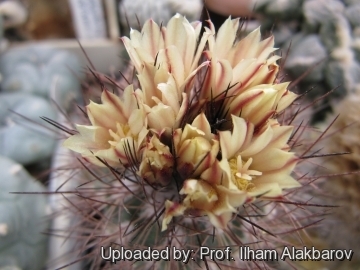 aureum, Epithelantha bokei, Grusonia bradtiana, Lophophora williamsii, Mammillaria chionocephala, Neolloydia conoidea, Agave lechuguilla, Dasylirion texensis, Euphorbia antisyphilitica, Hechtia glomerata, Fouquieria splendens, Larrea tridentata and many others. Description: Acharagma aguirreanum, often misspelled: "aguirreana" is a small plant with yellowish to reddish yellow flowers at the stem tips. Habit: Plants usually solitary unless damaged. Stem: Globose to depressed spherical, soft, medium to dark green, often tinged with bronze-rose or purple, to 5 cm high, 5-7 cm in diameter. Tubercles: Fleshy, pyramidal-conical, not grooved, somewhat flexible, to 5 mm long. Spines: Numerous all more or less similar. Radial spines: 13-16, often in two series, 8–15 mm long either whitish with darker tips or even orange to plum coloured. Fruits: Greenish purple or bronze coloured, to 12 mm long, 3.5 mm in diameter. Seeds: Dark-purplish red to black, berrylike, indeishent. 5) Anderson, E.F., Fitz Maurice, B & Fitz Maurice, W.A. 2002. Acharagma aguirreanum. In: IUCN 2013. “IUCN Red List of Threatened Species.” Version 2013.2. <www.iucnredlist.org>. Downloaded on 20 February 2014. 7) Moeller-Villar G. “Sierra de la Paila.” In: Aztekia 11: 24–28.1988. 8) Pilbeam J, Weightman B. 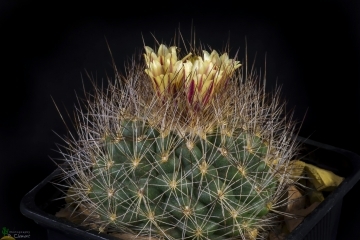 “Ariocarpus etcetera”. Castle Colour, Norwich, UK.2006. 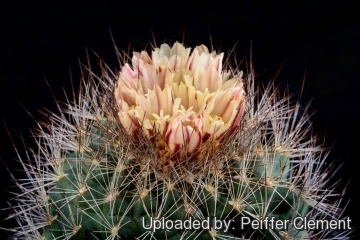 9) Glass C, Foster R. “Gymnocactus aguirreanus. 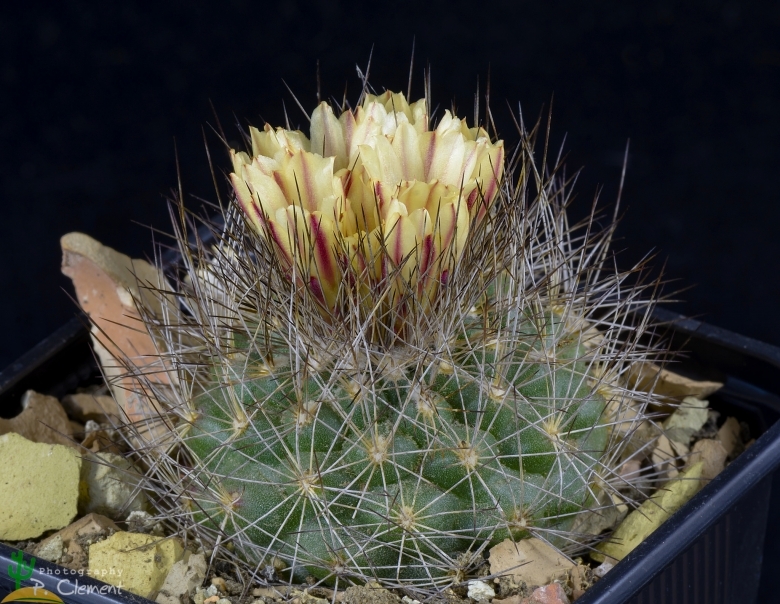 A new species from southern Coahuila, Mexico.” im: Cact Succ J (US) 44(2): 80–81. 1972. 10) Chalet J–M. “Four lovely days in Sierra Paila.” in: Cactus and Co. VII (1): 44–63. 2003. 11) Bravo-Hollis H, Sánchez-Mejorada H. “Las cactáceas de México II” . Universidad Nacional Autónoma de México.1991. 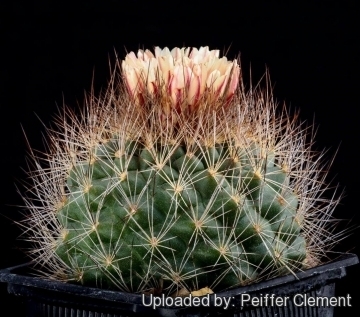 14) C. Glass, R. Foster “Gymnocactus aguirreanus: a new species from southern Coahuila, Mexico.” In:Cactus and Succulent Journal. Los Angeles 44(2): 80–81 1972. 15) Guía para la Identificación de Cactáceas Amenazadas de México. 1997. Cultivation and Propagation: Acharagma aguirreanum is very slow growing. Because of the tap root they are very rot prone, so use highly gritty compost with much drainage and water regularly in summer, but do not overwater, it prefer a completely dry place during winter. An unheated greenhouse would be perfect. It can survive low temperatures (appr. -7°C). Full sun to light shade.